There are many ways and methods to English Paper Piece. This is how I do it. 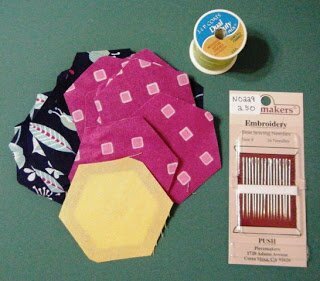 I've been piecing in earnest now for about 6 years and it works for me. There is no "right" or "wrong" way to do it - do whatever works for you. 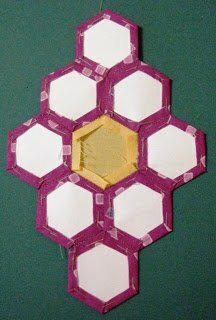 I'll be assembling a Double Diamond using 1" hexagon papers. I am right-handed. If you are left-handed, sew in the reverse of the photos. I should have trimmed my nails and used hand lotion before I started. Forgive my winter dryness! I've assembled the complete array of supplies that I use. Let's begin. 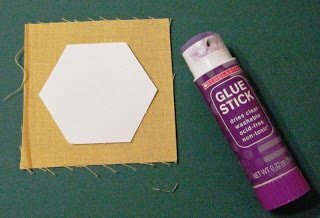 Use a small dab of glue to temporarily hold the paper to the fabric squares. I use a cheap, discount store glue stick - if it dries out or begins to get gummy, I throw it away and use a new one. 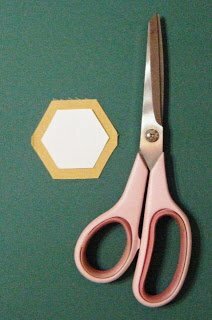 Use your large shears to trim away the excess, leaving a 1/4" seam allowance. Just eyeball it - it's better to err on the side of bigger than smaller! 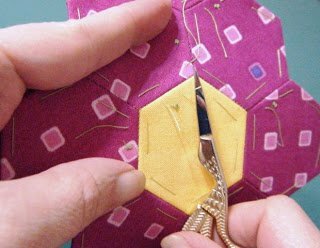 Once all your squares are glued and trimmed, you'll use your junk thread and the embroidery needles to baste the fabric to the papers. I discovered a cache of old Coats and Clark thread and use that. You can also use up threads on old bobbins to clear them off. This is thread you will discard later, so don't use the good stuff. I thread-baste through the paper. Many baste only the corners from the back, but I have trouble keeping longer sides taut for whip stitching later using that method. It doesn't take that long to baste through the papers, and it does not prevent your papers from being reusable later. Edited: I now use a Sewline Glue Pen and glue baste my papers if I am making something quickly or fairly small. If you are using really big pieces or you will be handling your project A LOT in the process, the glue baste may not hold. Cut a length of thread about 20" or so, thread your needle and make a large knot. Pick up your paper piece and fold the seam allowance to the back. 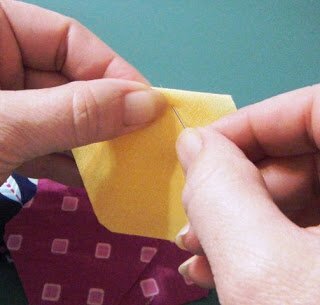 Beginning in the middle of a side, insert your needle from the top to the back, making sure that you catch the seam allowance in the back. 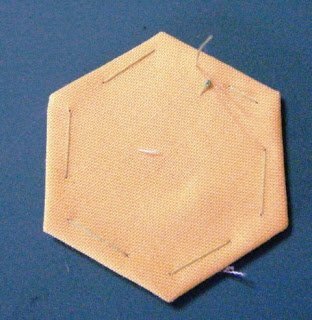 Fold the fabric in the corner (I call it a "hospital corner") and insert your needle back to the front. Be sure that you sew through both layers of the corner. Continue basting around the piece, going to the back on the sides and coming back up through the corners. 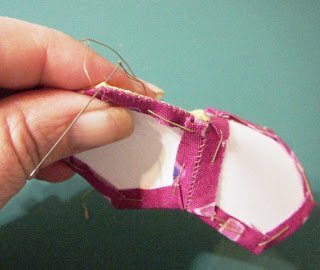 When you get back to the side where you started, take a small stitch to bring your thread to the top and cut cut it, leaving a 3/4" tail. Do not make a knot! Here's what it should look like from the back. Once you have basted all your papers, you can lay them out. It's time to begin sewing the pieces together. 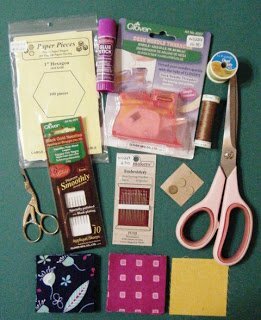 I use the Clover Black Gold #10 Applique needles and Aurifil Thread (50 wt.) for this step. The Black Gold needles are thin and really sharp, and the smaller thread makes a finer stitch. I find that using the Clover Desk Needle Threader invaluable. My eyes are not what they used to be! I also use leather Thimblepads instead of a thimble. They have an adhesive backing that sticks to the pad of of your finger. 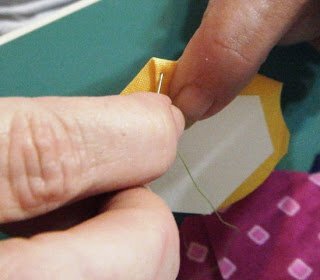 At the end of a sewing session, I take it off my finger and place it back on the slick paper it came from. I can use a single pad many times - until the adhesive wears off. Then I use a new one. Pick up your center piece and the first petal and place them right sides together, matching corners. Thread your needle with about 18" of thread and make a knot. 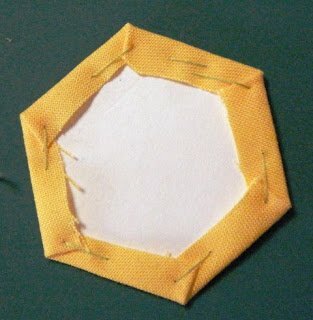 Insert your needle between the paper and the seam allowance to hide the knot. Begin whip stitching to join the pieces. 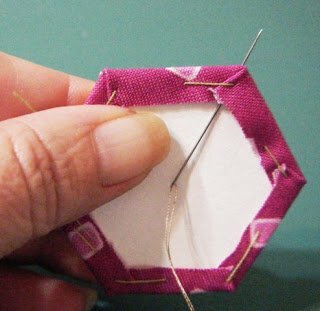 Start at the corner and slide your needle through the threads of the fabric at the edges of the papers. You don't want to pierce the paper; you just want to graze the edges of the paper with your needle. 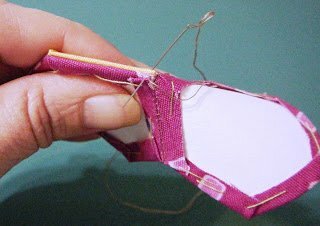 Continue taking stitches down the length of the side, grabbing edges of the fabric and just grazing the edges of the papers. 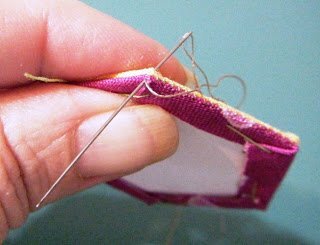 When you reach the second corner, take a second stitch in the corner and knot the thread off. Now to add the next piece. Place the 3rd piece right sides together. You're going to be sewing a Y-seam, but just concentrate on one side at a time. 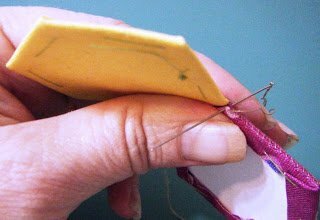 Slide your needle under the seam allowance and whip-stitch toward the "Y" corner. Once you reach the "Y" corner, take a second stitch. 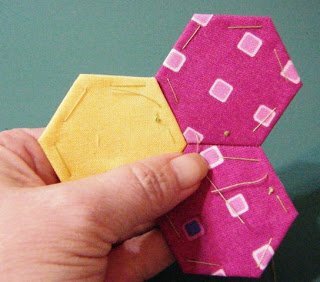 Flip the piece up, and then fold it back down, matching edges with the yellow center. 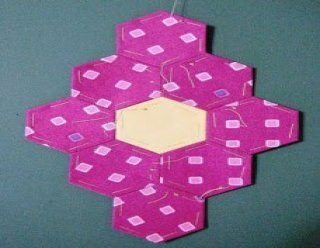 The first pink piece will bend inward - the paper is flexible enough to allow that. Continue stitching to the left corner. Take a double stitch and knot off. You have 3 pieces sewn together! Continue adding pieces until your first ring of the diamond is complete. Notice that the yellow center is now surrounded by other pieces. Once a piece is completely surrounded, you can remove the basting stitches and the underlying paper. 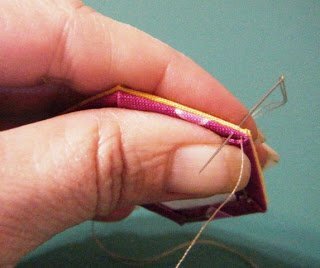 I use the tip of my embriodery scissors to unthread the basting and pull out the thread by the knot on top. Remove the paper and save it for later reuse. If you have pierced the paper with your stitching, just give it a yank. 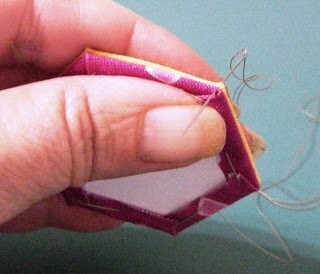 Once you have the knack for whip-stitching, you'll pierce the paper less often. 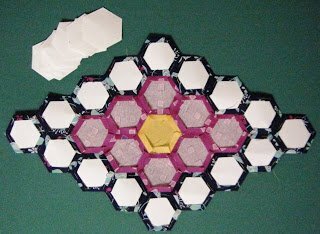 Add the outer ring of pieces. Remove the basting threads and papers from the inner ring. Here's a look at the back. All of the papers that you have removed can be used again. I have personally used papers 5 or 6 times. 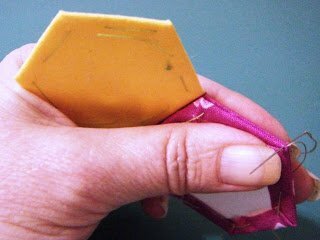 If the corners of the paper get worn and you have trouble making a sharp fabric corner, discard the paper. That's all there is to it! 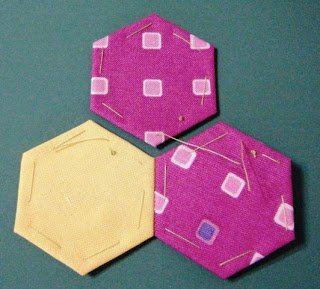 The basting and whip-stitching is the same for any shape or block that you'd like to Paper Piece. Now, a little hint about the paper pieces. The size of the piece is determined by the LENGTH of the side. 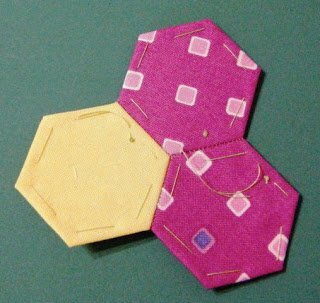 1" hexagon papers measure 1" along the sides, not across the width. All pieces labelled 1" will work together (or whatever size you choose to work with). I cut all my fabrics into squares or rectangles before I begin. I measure the width and heigth of the paper I am using and add at least 1/2" in each direction. 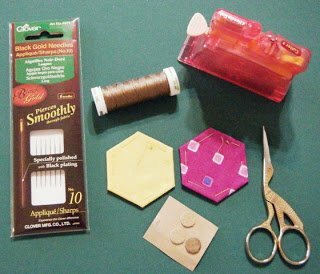 Beginning with squares and rectangles is much quicker than trying to fussy cut the correct shape. 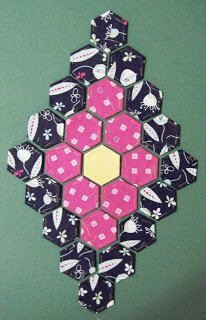 Click here to get free paper piecing patterns and design sheet downloads from Paper Pieces. 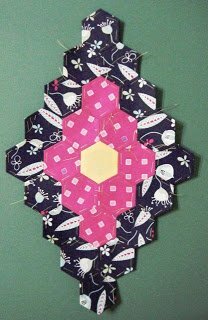 I hope you enjoy English Paper Piecing as much as I do! It's a quick, easy, and portable project to take on the go!